How Gripping Devices Develop Grip-Strength. What Are The Best Ones To Use? I will be covering what types of grippers are available, how effective they are, how they are used, and some programs you can use. Even a couch potato can benefit from this! Grip strength, as noted in various strength training articles and books, can be improved with a wide variety of specific movements. In addition to developing grip strength, these movements help to develop the muscles of the wrists and forearms. However, if one is wanting to maximize grip strength to the fullest possible extent, over a shorter period, it would be wise to employ one particular strategy—a strategy that achieves the full range of gripping motion, which ensures the greatest increases in strength and size. The gripper is one apparatus that can achieve both of these things while providing a rewarding workout experience. The type of grip strengthened with the gripper is crushing grip. This type of grip is demonstrated when two people shake hands, or when one screws the top off a jar. Obviously, from a practical standpoint, crushing-grip-strength is important. It is also important as far as strengthening the hands and wrist, in preparation for regular weight-training workouts. Indeed, this often neglected aspect of strength-training should be featured, to some extent, in ones training program if they are to realize their full strength potential. Holding back on specific crushing grip training might only serve to stifle future progress; in as far as lacking a sufficient grip will decrease ones ability to adequately stabilize the weights they are trying to control. Indeed, building grip strength will help to provide a more rounded strength base. Read on for a specific rationale on why grip strength should be prioritized, what types of grippers are the most effective, how grippers are used to build strength and size, and what program might be followed to achieve the greatest possible results. Much of what we do on a daily basis involves some degree of gripping strength. Lifting an object, opening a can, bottle or door, driving a car, and, of course, engaging in certain types of sport - golf, baseball, and tennis for example—all involve grip strength to a greater or lesser extent. Granted, grip strength is not something people automatically think of when they go to open a door or drive a car, but increases in gripping strength can improve day to day life quite significantly. An activity like driving for example, done over a long period, can physically exhaust the arms. A strong grip will help to ensure a continuation of such an activity over a longer period, due to lessened fatigue of the muscles performing the action. In short, with a stronger grip, one is able to perform better, over a range of activities. If a particular exercise is becoming increasingly harder, as the weight for that movement exponentially increases, chances are grip strength is one limiting factor responsible for compromising form. For example, on the deadlift, the single greatest total-body mass-builder, gripping strength is essential. Sure, wraps can be used, but this is time consuming, and takes away from the total strength building component of the movement. It is better to strengthen the grip, and confidently lift the weight without any physical restriction. Strong wrist and hands also assist with weight stabilization. A heavy weight places major stress on the wrist area, and this can also serve as a limiting factor. A solid grip, on the other hand, enables one to balance massive weights with greater confidence. In addition to the flow on effect of greater forearm growth, as a result of superior gripping strength across all upper body movements, the act of gripping a specially designed gripper will directly target the forearms. It is fair to say that any bodybuilder would be happy with a well developed set of forearms. The strength required to close a gripper will literally force the entire forearm complex to contract at a higher degree of intensity, compared to any other single movement. 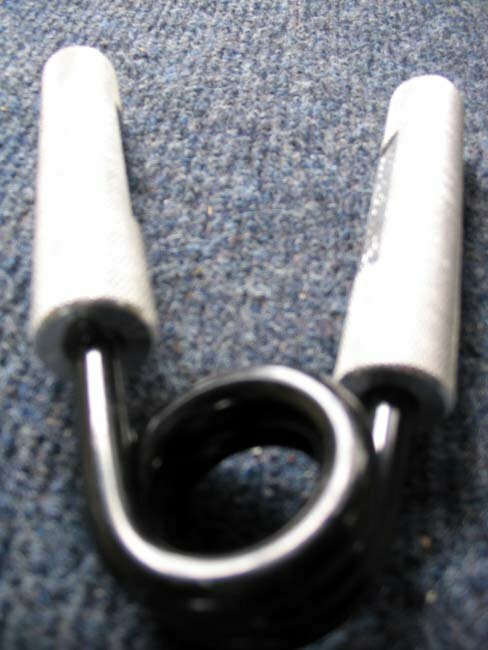 Developing the grip presents a unique challenge, and demonstrates what some would consider a feat of pure strength. Indeed, entire contests are developed around the act of gripping. Grip device manufacturers even lure customers with the prospect of advancing to a higher level, to become a "Gripping King". A grip of 300 lbs is generally the standard required to achieve "Grip King" status, and it is thought fewer than 100 people in the world are able to break this barrier. The practicality of using a gripping device also makes it something one can do any time, anywhere. A satisfying pump can be achieved - with a gripper - in the living room, in front of the television, for example. What Are The Best Methods? Grip-strength is determined by the strength, size and density of the bones and muscles of the hands, fingers, wrist and forearms. Thus, it is important to train for grip-strength with a device that will target all these structures to the fullest possible degree. The type of grip responsible for employing all these structures is crushing grip, so it stands to reason a device that purely employs this type of grip is needed. The single most effective piece of equipment used for improving crushing grip is the gripper, of which there are several different models on the market, all of which apply the same basic crushing grip principals. The four profiled grippers are regarded as some of the best on the market. They are very popular, as they all offer something different, yet provide excellent results. I personally use four of these grippers, and find using them together to be far and away more effective in building gripping strength, than using just one particular brand. One of the leaders (Harbinger) in exercise equipment has developed an interchangeable multi-resistance gripper, ideal for multi-rep grip training. Weight can be increased, or decreased, by five-pound increments, with pressures ranging from 30 to 40 pounds. Smooth, easy to use, action. Perfect for high-repetition endurance training. Aerospace cushioned inserts, molded into handles more maximum comfort. 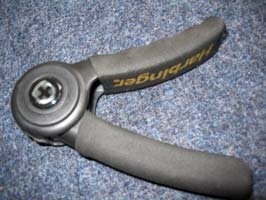 I found the Harbinger Adjustable gripper to be very enjoyable to use, in that the range of motion was very fluid, and the resistance levels were perfectly suited to high repetition training. I found these grippers to be very easy to use, also. Definitely not recommended for power training, but great for gripping endurance, I would rate them highly for comfort, ease of use, style and high-repetition function. Unlike the adjustable grip, the Harbinger Grip is a simpler device in that it is pre-set at the one resistance. For the beginning gripper, it provides the perfect starting point. For those wanting a high-repetition grip workout, at a slightly higher resistance compared to the adjustable grippers, the Grip is ideal. Exclusive contoured, injection-molded, construction, which keep the hand in the proper position when gripping. Constant tension is placed on the muscle due to a uniquely developed resistance mechanism. Small and easy to transport. PlastiGrip coating to prevent hand slippage. Again, these grips were comfortable to use, due to their molded construction. No hand sliding during use. I also found the pre-set resistance placed constant tension on the working muscles for a good forearm pump. A good overall gripper with a slightly higher resistance setting to the Adjustable Grip, it is good for a high repetition workout. I would rate these highly for ease of use, hand comfort, smooth action, and the ability to provide a good high-repetition workout. 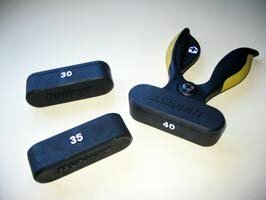 The Heavy Sports Heavy Grippers come in five levels of resistance: 100 lbs up to 300 lbs; in 50 lb increments. These grippers truly are heavy duty and not for the faint-hearted, as they provide extreme resistance from 200 lbs up. Designed for those who want to take their gripping workouts to the next level, Heavy Sports Heavy Grips are made of solid steel and provide more of a power workout. Heavy Grip 100 & 300lb. "Will You Accept The Challenge?" 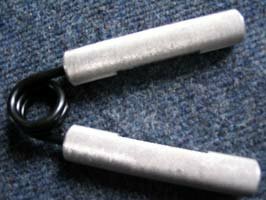 The suggestion with these grippers is to train for no more than 10-15 repetitions. If repetitions can be completed beyond this range, it is time to move up to the next level. Given most store-bought grippers only go up to around 50-100 lbs, the Heavy Sports Heavy Grippers are in a class of their own, as they provide a lifelong challenging workout. They will test the toughest of grips. These grips even come with their own certification program, which is rewarded to anyone who can successful close the 300 lb gripper. Any takers? Solid aluminum handles with an easy grip surface. Resistance ranges to challenge any grip. From the outset, these grips felt more powerful. The 100 lb grips were relatively easy to use, but provided a good higher-repetition workout nonetheless, while the 150 lb and 200 lb grips allowed me to complete only a few repetitions, but the pump was intense. Although I use all the suggested grips regularly, the Heavy Sports Grips are the ones I use most often, as they provide a greater deal of variety, and a better workout overall. The Altus Adjustable hand grip comes in three levels of resistance, and is perfectly designed to develop gripping endurance. It is small and lightweight for maximum convenience, and comes complete with contoured handles for a comfortable and secure grip. Although not as heavy duty as the Heavy Sports Grips, the Altus Hand Grip has the advantage of being lightweight with adjustable levels of resistance. Contoured handle for ease of use. This grip was very easy to use, and provided a good high-repetition workout. Its three levels of resistance made it easy to switch back and forth, to vary the resistance; like doing a weight-training dropset. Developing hand and wrist strength with one of the suggested grippers, is probably one of the simpler training feats one can do. However, despite its simplicity, successfully perfecting the gripper could be the most significant step taken toward stronger, more muscular, hands and forearms. To use a gripper, simply take hold of both handles with the correct hand positioning—which is usually outlined on the gripper—and squeeze the two handles together until they touch. Obviously, the hands should be squeezed as tightly as possible, to get the greatest possible benefit. As mentioned when describing these grippers, it is important to use each of them according to gripping goals one might have, although, for anyone's program, they all have merit. Choosing which one to use predominantly, is a case of whether power or endurance is sought or at what stage one is at. Only the hands should be performing the movement, so do not twist the arm, or the whole upper-body, to try to generate additional strength. This just defeats the purpose. Also, close the gripper all the way for a few, or even one rep, as opposed to completing several reps of a three-quarter movement. It is during the last quarter of this exercise that real results in strength occur. As mentioned, work up to harder grips as gripping strength increases. Start on the easiest grips and progress up, so as to avoid injury and achieve the greatest level of development. To perform successive grips successfully, it is important to achieve a sufficient intake of oxygen through correct breathing. Exhale when squeezing, inhale when releasing. Turn a relatively passive activity, such as television watching, into a major hand and forearm workout. Obviously, for the most part, training should be done without outside distraction. However, the wrist, and forearm, region, responds best to high frequency stimulation. Therefore, doing gripping exercises in a non-gym context should not present too much of an issue provided the rules of correct training - mentioned earlier - are applied. The wrist can be a very delicate structure, comparatively speaking. It is therefore important to ensure a lower pressure gripper is used prior to tackling the more advanced ones. Start with high reps at a low pressure and progress to lower reps at a higher pressure. Performing both single and multiple repetitions will provide two different stimuli, which will, respectively, develop different aspects of gripping strength. Higher repetitions will work the endurance fibers (red slow-twitch), whereas heavy singles will employ the faster-contacting power (white, fast-twitch) fibers. Gripping endurance and power will be established by mixing up the repetition ranges. Both ranges can be done in the same workout (advised), or one range at a time on separate days. With a heavy duty gripper, such as the Heavy Sports Heavy Grips, perform one repetition. Rest for a minute before performing another. The resistance must be such that only one repetition is possible. This rep should take several seconds. With a multi-resistance, or lighter resistance, type gripper, such as the Harbinger Adjustable Grip, or Grip, perform several repetitions. At the lower end of the scale for more power, perform between 10 and 15 reps. At the higher end, perform up to 100 or more. Close a gripper, which cannot be completed with one hand, with two hands. Transfer the closed gripper to one hand and perform a negative repetition—by resisting the pressure, as it pushes the hands apart. This action helps one to develop the required strength to move up a level to close a higher resistance gripper. The workouts in this program can be done on training, or non-training, days, as they will not significantly compromise recovery from other training stimuli. Workouts should last no longer than 15-minutes. If the prescribed weights prove to high a resistance, aim for lower reps until form and strength are developed to a sufficient level. Warm-up: 30 repetitions at 40 lbs resistance on the Harbinger Adjustable Grip. Set 1: 15 repetitions at 100 lbs on the Heavy Sports Heavy Grips. Set 2: 15 repetitions at 100 lbs on the Heavy Sports Heavy Grips. Set 3: 5-10 repetitions at 150 lbs on the Heavy Sports Heavy Grips. Set 4: 1-2 repetitions at 200 lbs on the Heavy Sports Heavy Grips. Set 5: 1 repetition at the highest possible resistance. Set 6: 1 repetition at the highest possible resistance. Click Here For A Printable Log Of Monday: Power Day. Warm-up: 30 repetitions at 40 lbs on the Harbinger Adjustable Grip. Set 1: 20-30 repetitions on the Harbinger Grip. Set 2: 20-30 repetitions on the Harbinger Grip. Set 3: 80-100 repetitions at 30 lbs resistance on the Harbinger Adjustable Grip. Set 4: 80-100 repetitions at 30 lbs resistance on the Harbinger Adjustable Grip. Click Here For A Printable Log Of Wednesday: Endurance Day. Click Here For A Printable Log Of Friday: Power Day. 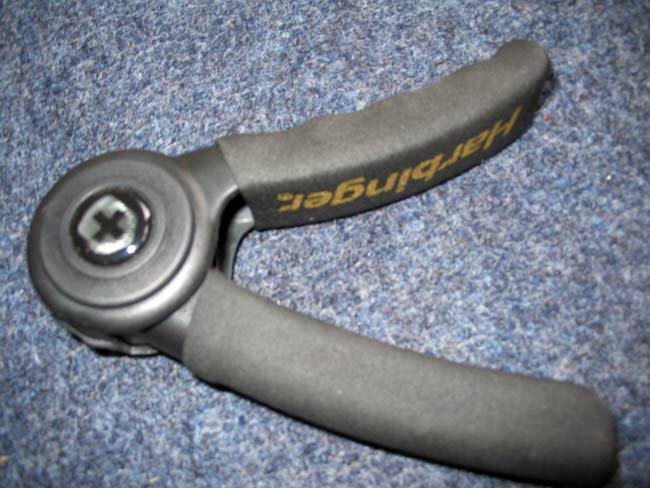 Warm-up with 30 repetitions at 40 lbs on the Harbinger Adjustable Grip. Set one: 100-150 repetitions at 30 lbs pressure on the Harbinger Adjustable Grip. Set two: 100-150 repetitions at 30 lbs on the Harbinger Adjustable Grip. Click Here For A Printable Log Of Saturday: Endurance Day. Greater hand strength on all upper-body weight movements. Noticeable growth in my entire forearm area. A progression from 100 lbs for 15 repetitions to 100 lbs for 50 repetitions. A progression from 200 lbs for no repetitions, to 200 lbs for one repetition. Thicker, larger, and stronger hands. Grip strength is something every trainer should take seriously, as opposed to relegating to secondary status. A strong grip will enhance all manner of daily functions, not to mention specific sporting feats. By following the program prescribed in this article, and using the featured grippers, one will undoubtedly transform their forearms, wrists and hands into powerful packages of strength.